In a DC machine, two kinds of magnetic fluxes are present; 'armature flux' and 'main field flux'. The effect of armature flux on the main field flux is called as armature reaction. EMF is induced in the armature conductors when they cut the magnetic field lines. There is an axis (or, you may say, a plane) along which armature conductors move parallel to the flux lines and, hence, they do not cut the flux lines while on that plane. 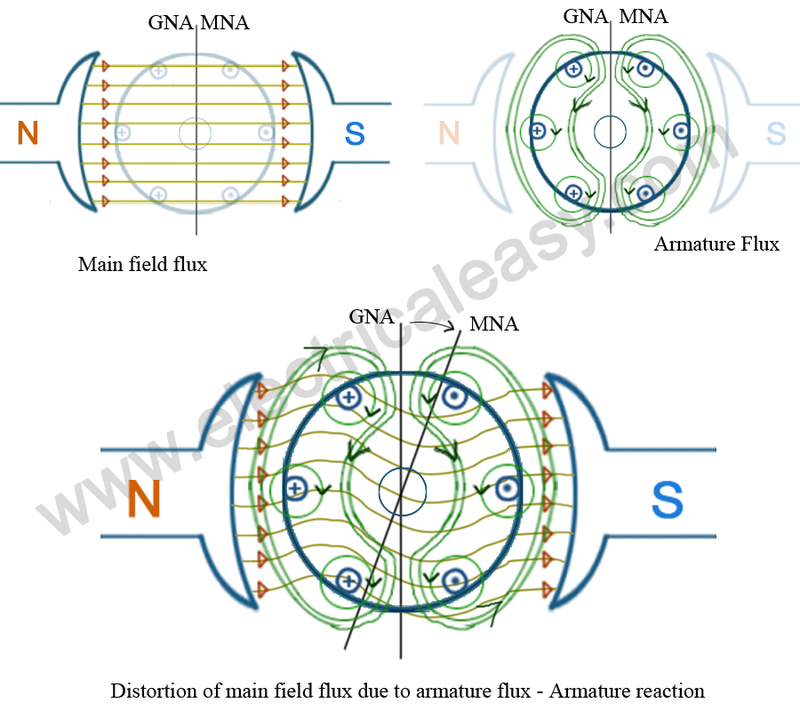 MNA (Magnetic Neutral Axis) may be defined as the axis along which no emf is generated in the armature conductors as they move parallel to the flux lines. Brushes are always placed along the MNA because reversal of current in the armature conductors takes place along this axis. GNA (Geometrical Neutral Axis) may be defined as the axis which is perpendicular to the stator field axis. The effect of armature reaction is well illustrated in the figure below. Consider, no current is flowing in the armature conductors and only the field winding is energized (as shown in the first figure of the above image). In this case, magnetic flux lines of the field poles are uniform and symmetrical to the polar axis. The 'Magnetic Neutral Axis' (M.N.A.) coincides with the 'Geometric Neutral Axis' (G.N.A.). The second figure in the above image shows armature flux lines due to the armature current. Field poles are de-energised. Now, when a DC machine is running, both the fluxes (flux due to the armature conductors and flux due to the field winding) will be present at a time. The armature flux superimposes with the main field flux and, hence, disturbs the main field flux (as shown in third figure the of above image). This effect is called as armature reaction in DC machines. Armature reaction weakens the main flux. In case of a dc generator, weakening of the main flux reduces the generated voltage. For a loaded dc generator, MNA will be shifted in the direction of the rotation. On the other hand, for a loaded dc motor, MNA will be shifted in the direction opposite to that of the rotation. Usually, no special efforts are taken for small machines (up to few kilowatts) to reduce the armature reaction. But for large DC machines, compensating winding and interpoles are used to get rid of the ill effects of armature reaction. Compensating winding: Now we know that the armature reaction is due to the presence of armature flux. Armature flux is produced due to the current flowing in armature conductors. Now, if we place another winding in close proximity of the armature winding and if it carries the same current but in the opposite direction as that of the armature current, then this will nullify the armature field. Such an additional winding is called as compensating winding and it is placed on the pole faces. Compensating winding is connected in series with the armature winding in such a way that it carries the current in opposite direction. Interpoles:Interpoles are the small auxiliary poles placed between the main field poles. Winding on the interpoles is connected in series with the armature. Each interpole is wound in such a way that its magnetic polarity is same as that of the main pole ahead of it. Interpoles nullify the quadrature axis armature flux.